LAS VEGAS – Floyd Mayweather Jr. fought a brilliant defensive fight and did enough offensively to defeat Manny Pacquiao by a unanimous decision Saturday at the MGM Grand. Pacquiao (57-6-2, 38 knockouts) pursued Mayweather (48-0, 26 KOs) from beginning to end, groping for ways to land any punch he could. And he had his moments, firing quick combinations whenever he got close enough. 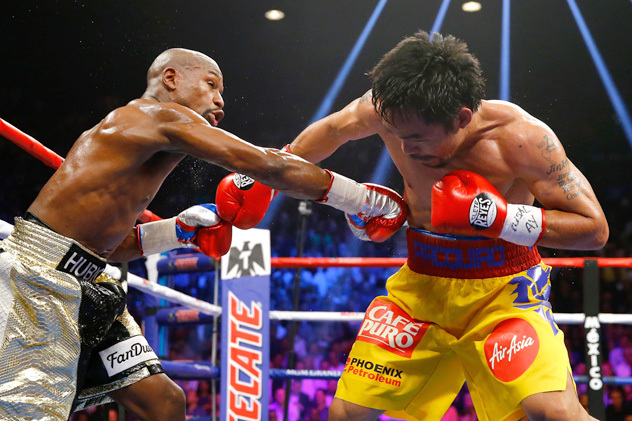 However, it was uphill the entire fight for Pacquiao as Mayweather rolled, held or ran to avoid getting hit. The fans at the MGM Grand Garden Arena, who chanted Pacquiao’s name throughout, were frustrated at Mayweather’s tactics but they were very effective. Meanwhile, Mayweather wasn’t particularly busy, generally throwing one punch at a time. His shots were often accurate, though, whether he was jabbing or timing his rights perfectly when Pacquiao rushed in. The judges scored it 118-110, 116-112 and 116-112. I had it 116-112. Naturally, the pro-Pacquiao crowd booed the decision and Mayweather when he was interviewed after the fight.